While in Kansas City, the IT department decided the best solution to my laptop’s performance issues was to replace it with a new model. When I returned home, I discovered that the laptop’s size would require me to make my first visit to an obscure woodworking district that lies along the railroad tracks near the entrance to the Chalerm Mahanakorn Toll Road. 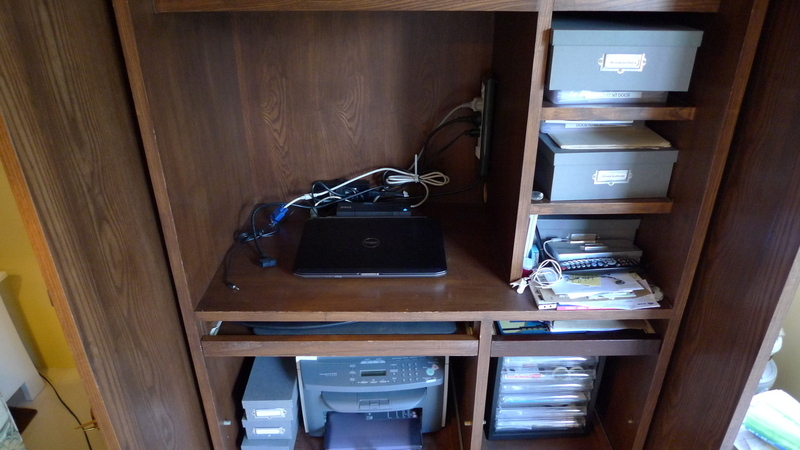 The new laptop in its place in my office armoire. The laptop is about three-quarters of an inch wider than the previous one, although thankfully they are both made by Dell and use the same docking station. (A docking station, if you aren’t familiar with it, is a device that allows your laptop to function as a desktop computer. You can turn it on while it is closed, attaching it to an external monitor, laptop, and mouse. Very helpful for those of us who really aren’t traveling anywhere with our laptops and would like a large monitor.) 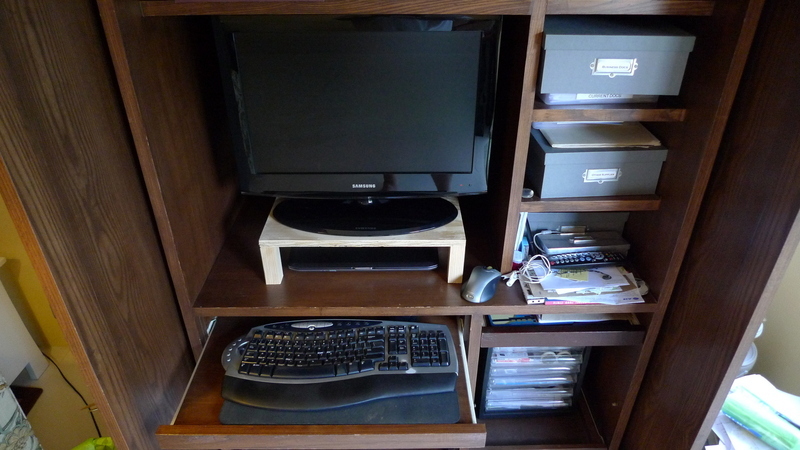 Since this laptop was wider than the previous one, the wooden shelf I had used as a monitor stand would no longer fit. 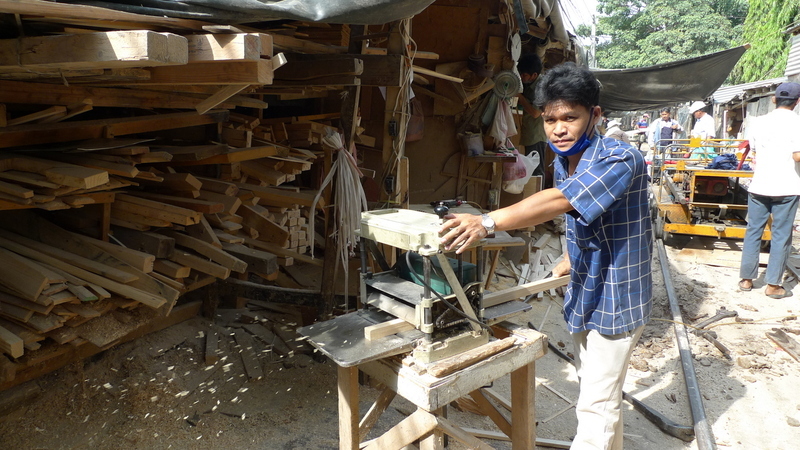 Alongside a dusty road near the entrances to the Khlong Toei Port and the toll road, is a row of woodworking shops. 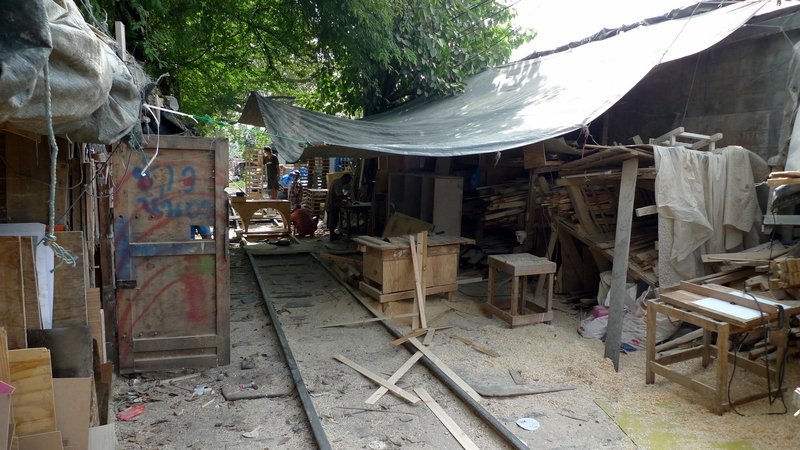 This ragged bunch of shops looks more like a shanty town than a business district, but these businesses can fashion most anything from wood. The shops closest to the port focus on making shipping pallets. Further down are shops with photo albums showing the wares from bookcases to bedposts that they have made. Not sure which shop would be the best one, we walked for a bit until finding someone who looked welcoming rather than wary. We showed him the sketch I had drawn, explained what we were looking for, and he went off to find some sample pieces of wood to see if the quality would be sufficient. 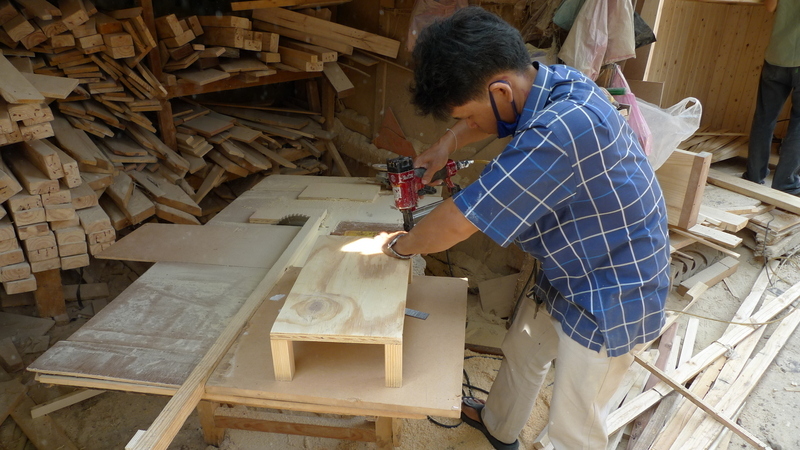 After settling on the wood, he started cutting and rough sanding. I noticed a lack of safety equipment being used by any of the workers. I also noticed that our fellow was missing part of one finger. Looking down the inside area of the shops, it is unclear where one ends and the next begins. Perhaps it is all really just one big shop with different fronts? The railroad tracks running down the middle of the shops were no longer shiny silver on top, so I concluded that the tracks are not frequently used. That said, some repairmen with a rail repair cart appeared to be fixing the rails, so maybe they are still in service. After about ten minutes and a couple of careful measurements (he ascribed to the “measure twice, cut once” philosophy – a good sign), the woodworker glued and nailed the legs onto the monitor stand and checked that it was level. We turned down an offer to stain it – I can do that in the future, if I so desire – and headed home. The price for materials and labor? 400 baht – about $13.50. The finished product, the monitor on the (admittedly not the most handsome) monitor stand with the laptop underneath, and a remote keyboard. Not only is the end product completely satisfactory, but I enjoyed finally having a chance to see what was going on at the woodworking community next to the tollway entrance. 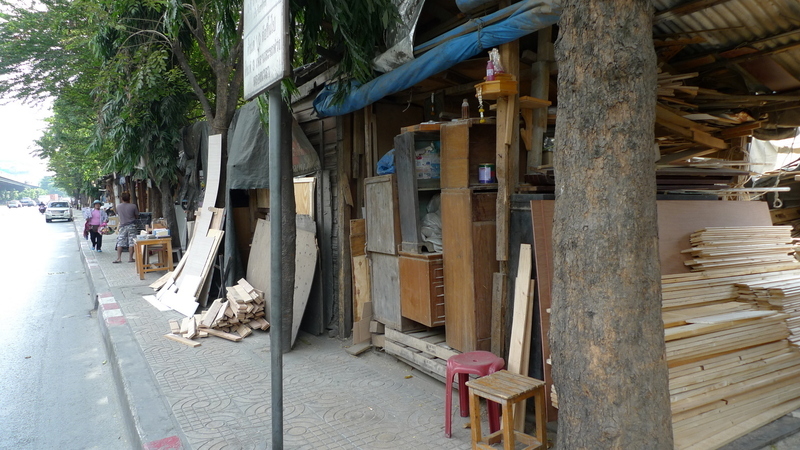 This entry was posted in Uncategorized and tagged Bangkok, Community, Computer, Khlong Toei, Monitor, Stand, Wood, Woodworking by christao408. Bookmark the permalink. Wow ..$13 blows me away. Thoroughly enjoyed following you along the shops. Great post. Can they build one for me too? Nice stand Chris. So nice to be able to go to a shop and have a stand custom built. No way could that happen here without mortgaging the house to pay for it. @CurryPuffy – Absolutely. Send the dimensions plus $82.99 in shipping and handling. LOL@icepearlz – I try, thanks. =D@stebow – I recall going to TAP Plastics in the South Bay and you could have them custom make things out of acrylic for a pretty reasonable price. Don’t know if they are still around, though. @awoolham – Glad you enjoyed the journey. Cool! A little black enamal paint or some cherry stain and tung oil and you are all set! The lack of safety equipment is astonishing. That’s beautiful! I like it. But its light color makes it stand out from the others. How about drawing some pictures on it or writing some words on it? The cost is about 100 Hong Kong dollars. That is reasonable. Carpentry is a great job. I remember doing it at middle school. I have made a wooden hanger at school. That hanger was very durable. It lasted for several decades. I couldn’t hammer two pieces of wood together without breaking something. I’m guessing he also sanded down the edges as well? I’m astounded at the price. I’m going to be working from my home a lot and I’m starting to look for decent office chair (maybe a sugar daddy can bring me a Herman Miller chair) and probably get a monitor as well. Working on a laptop for an entire day is tiring on the shoulders and neck. gosh thailand is expensive – I bet the wood is great!! putting in some polish would ruin it – I love the way wood comes in in its natural naked colour!! I watch an Amish carpenter build a cabinet I had ordered for my sister for her birthday. I was amazed – ok I cannot do must in carpentry. He worked hard and was pleasant and not expensive! Looks very good Chris. As always, the roadside work shop reminds me of home. @murisopsis – Astonishing and not surprising, all at the same time. @ZSA_MD – Yes, there are so many parallels – life just happens in countries like Thailand and India. You don’t get into a car and drive to a “Home Depot” somewhere, you just go to a roadside shop and what you need gets done/made. @Fatcat723 – I always thought it would be interesting to learn woodworking. @alwateen – In this case, it is pretty cheap looking wood – plywood, in fact – so a bit of color wouldn’t hurt! =D@ElusiveWords – His sanding was just putting it through a planer. It is still pretty rough around the edges – literaly. @ClimbUpTreesToLookForFish – The idea of writing on it is an interesting one. Reminds me of my uncle, who used to bring his lunch to work everyday in a steel lunch pail. He had a banana for lunch every day and decorated the outside of the pail with the stickers. Several years later, you could barely see the metal. @yang1815 – And the taxi ride to get there cost me something like $2.50.